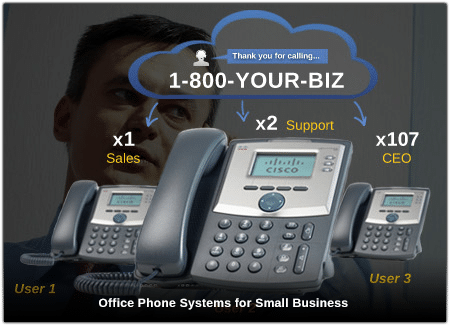 It’s time for your company to look at small office phone systems for small business. Today, more than ever before, small office phone systems are more affordable. And today, more than ever before, phone systems for small business are more powerful. Businesses all over the world are leaving their old PBX telephone services behind and moving to a hosted VoIP phone system. There’s no need for a closet full of telecommunication equipment if your company is utilizing a hosted phone system because everything is in the cloud. Because today’s modern small office phone systems are cloud-based, employees working in different locations can stay connected. Traditional phone systems for small business required all employees to work from one office. Get a small business virtual phone system and get all the power of a traditional PBX telephone service without the cost or equipment. The phone systems small business uses today are loaded with amazing features. 1. Modern business phone systems require no complex hardware or software. 2. Getting a small office phone system today requires no upfront investment or long term contracts. 3. Modern small office phone systems allow employees to work remotely from anywhere on any device.